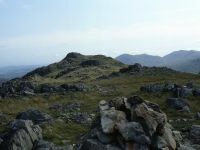 This was a walk on which I set out to "mop up" a few unclimbed peaks in the Central Fells range. 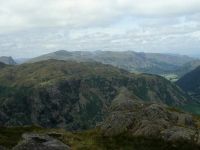 I was aiming intitially for Eagle Crag and Sergeant's Crag, both "tops" of High Raise. This is Eagle Crag, which stands dramatically over the Stonethwaite valley off Borrowdale, at the bifurcation of Langstrath and Greenup. 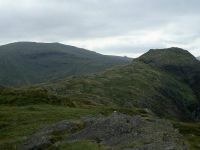 Looking into Greenup, a high pass over to Grasmere that carries the Coast-to-Coast long distance path, with Eagle Crag to the right. A retrospective view down Greenup Gill. It's quite lush at this level but higher up the scenery becomes drab with a number of glacial moraines. 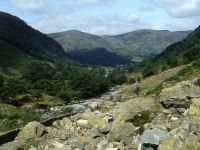 To get to Eagle Crag one has to divert from Greenup Gill and cross an area of pathless terrain and approach the summit from the southeast. 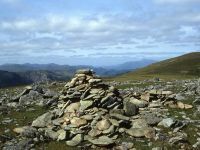 The tiny cairn, seen here, is perched on the apex of a huge slab of tilting rock, the summit of the crag. We're looking along the Stonethwaite valley towards High Spy and Maiden Moor. Here we're looking north to Skiddaw, with Grange Fell and Ullscarf in the middle distance. A dramatic view along Langstrath from the same point. 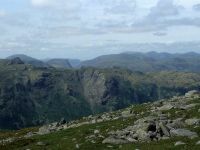 Rossett Pike is at the head of the valley and Bowfell rises beyond. Eagle Crag was my 100th Lakeland fell. 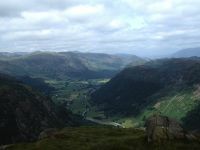 Looking south from the top of Eagle Crag. 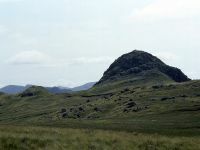 High Raise is the rounded hill to the left, Sergeant's Crag is the turret-shaped summit to the right and is my next objective. 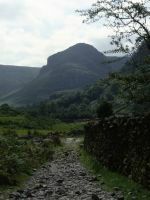 It's a bare half mile from Eagle Crag to Sergeant's Crag but it's quite a dramatic walk, alongside a stone wall on the edge of a steep slope plunging down to Langstrath. 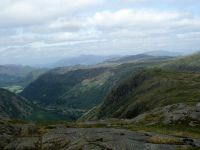 Here I'm at Sergeant's Crag looking back at Eagle Crag. Looking west. 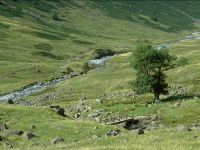 Rosthwaite Fell is on the opposite side of Langstrath, while the Dale Head group is seen beyond. 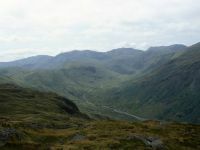 Langstrath seen from Sergeant's Crag. 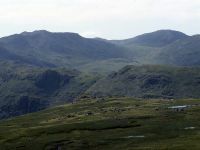 Bowfell and Esk Pike form the skyline. 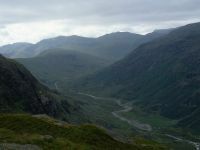 A mile and a half to the south, on an ever-improving path, brings us to High Raise. 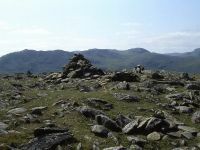 At 2500 ft it's the highest summit of the Central Fells and is regarded as pretty much the centre of the Lakeland fells. Here I was a couple of hundred yards short of the cairn. I wish I'd thought to take a picture at the actual summit. The weather started to improve rapidly, and on a whim I pushed onwards. A revised plan took shape, in which I'd take in as many of the Langdale Pikes as I had time for, and then descend via Stake Pass to Langstrath and then back to Stonethwaite. 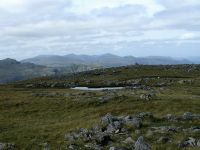 Here, on the southern slopes of High Raise, I'm looking west to Glaramara. The Dale Head group is seen beyond. 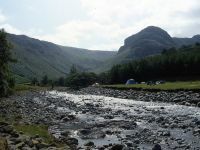 Strictly speaking the rest of these images should be on the Langdale Pikes page but I don't want to split the walk over two galleries so they're staying here. This is the north top of Thunacar Knott, a mile south of High Raise. There's only 130 ft of reascent. 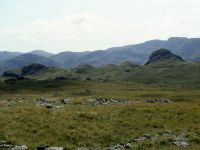 Thunacar Knott is a curiosity, little more than a swelling in the moorland plateau to the rear of the Langdale Pikes yet technically their parent fell. It's lovely terrain, lush grass flecked with rocks and boulders. 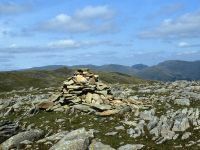 The summit of Thunacar Knott, 2351ft. 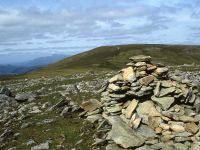 Skiddaw can be seen peeping through the col to the right of the cairn. Panning a little to the right we see the bulk of High Raise to the north. 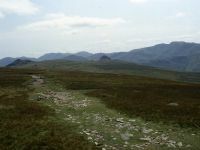 Another part of Thunacar Knott's panorama; looking northeast towards Helvellyn and Fairfield. A little tarn laying between the north and south tops. 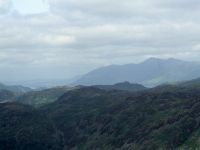 That's Harrison Stickle, which lays half a mile to the south east. 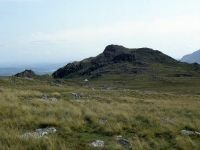 I began to make my way to Harrison Stickle but realised that I was pushing my luck and would have to make my way to Stake Pass and the descent to be in time for the last bus nack to Keswick. I've turned to the right and I'm heading for Martcrag Moor. Loft Crag and Pike O'Stickle lay dead ahead. Pike O'Stickle looms dramatically in this shot. A good view of Rossett Gill from Martcrag Moor. Angle Tarn lays in that dip beyond Rosett Gill, and behind it rise Bowfell and Esk Pike. The last shot of the day - the foot of Stake Pass, and I halted for a few minutes at the scene of our wild camp in Langstrath three years before. From here I walked the length of Langstrath back to Stonethwaite, for the return bus to Keswick. It had been a long but satisfying day.